Jason Mercier has defeated a pro-heavy field of 550 entries in the $5,000 No-Limit Hold'em Six Max event at the 2015 World Series of Poker. Mercier collects the first place prize of $633,357 and his third gold bracelet. This is Mercier's first gold bracelet in No-Limit Hold'em. His first two came in Pot-Limit Omaha, one which was a six-handed event. With this victory, Mercier joins an elite group of players with three or more gold bracelets. "I haven't won one yet. That's kind of what feels good about it, said Mercier about winning his first bracelet in No-Limit Hold'em. This win couldn't have come at a better time for the Florida native. Mercier has had a tough series thus far, cashing in only one event. Winning one midway through the series not only makes-up for his struggles early on, but also gives him momentum heading into the second half of the series. "It feels great. I was really down on myself. I was getting beat up in cash, busting every tournament. This is the first tournament I made Day 2 of. It feels really good just to go deep, make the final table, and to win is just the cherry on top," said Mercier. Mercier recorded the first three knockouts at the final table to give himself a large chip lead with only three players remaining. In the span of eleven hands, Mercier knocked out James Obst, Igor Dubinsky, and Dario Sammartino (in that order). He eliminated Obst on the river with a miracle four-outter that would change the whole dynamic of the final table. If Obst would have won that pot, he would have become the chip leader and Mercier would have been left short. Mercier rode the momentum of that river card to knock out Dubinsky in fifth place and Sammartino in fourth place.His last opponent to fall was Simon Deadman. Deadman is from Cambridgeshire, England and was looking to become the second Brit to win a bracelet this series. The two players battled back and forth heads-up a good hour before they flipped for the championship. With just a slight chip lead, Mercier four-bet shoved all-in preflop. Deadman contemplated his decision for a few seconds and then threw in the call. Mercier's pocket sixes would hold against Deadman's king-queen, despite Deadman flopping an open-ended straight draw. As the river bricked out, Mercier's rail flooded onto the stage, led by last week's $1,500 No-Limit Hold'em runner up finisher, Natasha Barbour. The always loud and faithful British rail fell silent. Deadman congratulated Mercier and then was congratulated himself by his rail. Although the Brits didn't get the bracelet this time, they proved once again they are some of the best fans in the game. Six-max events at the series generally garner some of the toughest fields the WSOP has to offer. The short-handed play weeds out the weak quickly and allows the brightest and best to rise to the top. This six-handed event was no exception. The final table featured three gold bracelet winners in Mercier (3), Gorodinsky (1) and Dubinsky (1). The other three, Obst, Sammartino, and Deadman, may not have a bracelet quite yet, but still hold their own with a combined 27 WSOP cashes for more than $1 million. 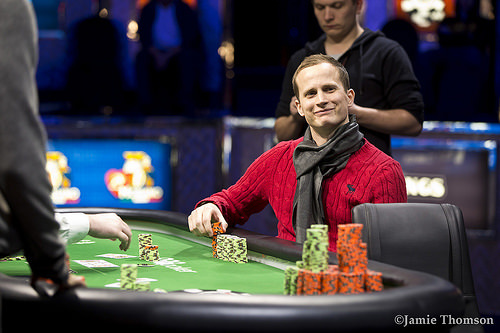 Just missing out on the final table was one of the WSOP's hottest players, Pierre Milan. Milan won a gold bracelet last year and just missed out on a second this year after finishing runner-up in the No-Limit Hold'em Eight-Handed event. Milan went out in this event in 8th place for $56,637. Mercier had plans to play in the $10K version of this event, which began today, but those plans went out the window after the final table for this event ran deep into the night. Mercier will have to settle for spending the rest of his evening with friends, drinks and a little open face. Second Place: Simon Deadman, a 27-year-old professional poker player from England records his largest ever WSOP cash with this runner-up finish. Third Place: Mike Gorodinsky has now recorded a 2nd, a 3rd and a 9th place at this year's series alone. His one and only gold bracelet was won in 2013 in a Omaha/Seven Card Stud 8 or Better event. Gorodinsky continues to impress as this year's series and has put himself in contention for Player of the Year with his three deep runs. 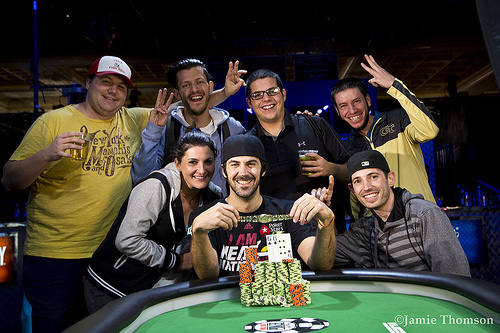 Fourth Place: Dario Sammartino, a 28 -year-old poker pro from Naples, Italy, ended up as the 4th-place finisher. He cashed for the 13th time in his career at the series. This marks Sammartino's second final table of the 2015 series. He finished in 6th place in the $10K PLO Championship for just over $60,000. Fifth Place: Igor Dubinsky finished in 5th place. Dubinsky won last year's Little One For One Drop tournament for $637,539. Dubinsky is from Dnepropetrovsk, Ukraine. This marks his third career WSOP cash. Sixth Place: James Obst, from Adelaide, Austrailia, cashed in 6th place. Obst now has eight WSOP cashes for just shy of $400,000 in tournament earnings. Obst's biggest WSOP cash came last year when he finished in 10th place in the $50,000 Poker Players Championship for $115,447. 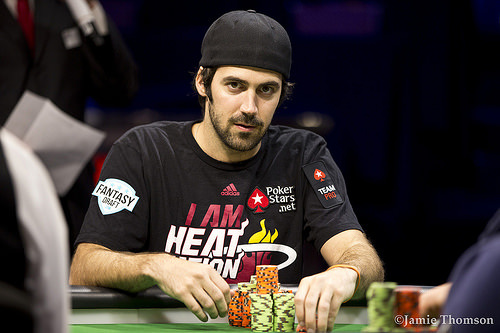 Jason Mercier raises on the button to 240,000 and Simon Deadman three-bets to 720,000. Mercier takes a moment and asks for a count of Deadman's stack before he announces an all-in bet. Deadman ponders for a moment and tells Mercier he has king-queen before he pushes forward one stack of green chips, indicating a call. Mercier is ahead, but the flop gives Deadman outs to a straight and a bigger pair. The turn is a blank, as is the river and Deadman is out in 2nd place for a $391,446 payday. Congratulations to Jason Mercier who topped a field of 550 entries to win his third WSOP Gold Bracelet and a $633,357 first place prize. Simon Deadman raises to 240,000 from the button and watches as Jason Mercier bumps it up to 680,000 from the big blind. The bet is called before both players watch the flop come down . Mercier leads out for 460,000 and is called before both players check the on the turn. After the dealer produces the on the river, Mercier checks. Deadman towers up a bet of 1,085,000 in chips and slides it into the middle. Mercier makes the call and tables his . Deadman rolls over his meaning both players chop the pot with their ace-highs. Jason Mercier limps into the pot before Simon Deadman raises it up to 400,000. The bet is called and both players watch the flop come down . Deadman slides out a continuation bet of 565,000 which is called, before both players check the that fall on the turn. Another round of checks follow after the completes the board before Deadman tables his for a pair of tens. The hand is good enough to take down the pot as Mercier mucks his hand. On the button, Simon Deadman bets 240,000. Jason Mercier calls and the flop is . Mercier checks and Deadman bets 220,000. Mercier calls and the turn is the . Both players check and see the on the river. Mercier leads out for 480,000 and Deadman folds. Jason Mercier raises to 240,000 from the button. Simon Deadman three-bets to 660,000 and Mercier folds. Jason Mercier gets a walk. Simon Deadman gets a walk. Jason Mercier calls in the small blind and Simon Deadman checks his option on the big blind. The flop is and Deadman checks. Mercier bets 120,000 and Deadman folds. Simon Deadman keeps up with his aggression with a raise to 240,000 from the button. This time Jason Mercier comes over the top with a raise to 680,000 which forces Deadman to fold his hand. Jason Mercier raises to 240,000 from the button before Simon Deadman bumps it up to 700,000 from the big blind. Mercier thinks for a moment before releasing his hand into the muck. Simon Deadman raises to 240,000 from the button and watches as Jason Mercier tosses his hand into the muck. Jason Mercier raises to 240,000 from the button and is called by Simon Deadman. The flop comes down and Deadman checks. Mercier slides out a 190,000 continuation bet which is called shortly after. Both players then check the on the turn before the completes the board. After both players check for the final hand, Deadmann rolls over his for king high which is good enough to take down the pot. Simon Deadman raises to 240,000 from the button and takes the pot after a fold. Jason Mercier opens on the button with a raise to 200,000. Simon Deadman calls and the pair see a flop. Deadman checks and Mercier bets 190,000. Deadman calls and the turn is the . Both players check and see a river. Again, both players check and Mercier tables . Deadman tables and the two will split the pot with two pair, twos and threes with a king kicker. Simon Deadman opens to 200,000 on the button. Jason Mercier three-bets to 630,000 and Deadman calls. On the flop, Mercier leads out for 370,000 and Deadman folds. Jason Mercier raises to 200,000 from the button and is called by Simon Deadman on the big blind. The flop comes down and Deadman checks. Mercier throws out a continuation bet of 150,000 and watches as Deadman comes over the top with a bet totaling 435,000. Mercier makes the call before the drops on the turn. Deadman pauses for a moment before sliding out 865,000 in chips. Mercier calls shortly after prompting the dealer to produce the on the river. Deadman checks over to Mercier who reaches for his chips. He counts out a bet and slides in 1.9 million in chips. Deadman calls shortly after, only to muck his hand, after Mercier rolls over his for two pair. On the button, Simon Deadman raises to 200,000. Jason Mercier three-bets to 630,000 and Deadman calls. The flop is and Mercier leads out for 415,000. Deadman calls and the turn is the . Mercier, once again, leads out with a bet of 1,210,000. Deadman calls and the river is the . Mercier checks and Deadman moves all in for 4,100,000. Mercier folds and Deadman rakes in another pot.